Now Is The Time To Restore Your Drive or Storage Pad with Roadbase! This is the time of year to resurface (renovate) your existing driveway or parking area to be sure they are ready for winter weather without creating muddy spots and pot holes and ruts, as well as to create or expand a driveway or parking lot. The best material for this application is roadbase. It is warm enough to spread and compact the road base well, (and the cooler nights makes it contract and compact even more). The driveway or parking lot should be as level as possible with any ruts and potholes filled. Roadbase is a good material for filling in low spots, but it will require more material to fill the same area. Once the holes are filled and covered with roadbase the area should remain level and compacted. Roadbase is engineered to be applied at lifts of 2 inches thick or more to compact well and stay compacted, however you don’t want it thicker than 4 inches unless you are going to separately install and compact each 2 inch layer. Otherwise it may not compact uniformly and you will have a soft and spongy driveway! Click here to learn about the different roadbase types. 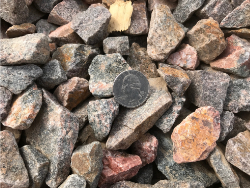 Our Mountain Granite Landscaping Rock is the highest quality available in the Front Range of Colorado and 34% cheaper per ton than Local River Rock. And the 3/4 inch Mountain Granite Rock covers over 30% more area per ton than the 1 1/2” Mountain Granite rock. When you buy our 3/4 inch Mountain Granite for your landscaping or driveway project you save almost 65% over doing the same project with Local River Rock, and much more when you compare our prices to our competitor's. Compare our Granite decorative rock price’s to other local companies before purchasing! That’s why we say “Savings by the Truckload!” Call us today for a "no cost or obligation" material and delivery Bid. Thank you for visiting our site, please feel free to contact us anytime we can be of Service, even just to answer any material questions you may have. Is your horse this happy about getting new stall material? Recent Customer Projects We Have Completed! Click here to visit our projects page where you can see a variety of projects we have been involved in. Thanks for visiting! Do you have a landscaping or driveway project that you want to consider for this year, but not sure what it will cost? We have a form you can use to tell us abot your project needs and receive an exact price you an rely on. Click here to submit a Request a Bid form and receive a no cost or obligation, exact price material and delivery Bid. A Solid Price, Delivery Included, That You Can Rely On! When people call or email us for pricing, we provide a complete bid based on amount needed and exact location. The price is as we call it,"to the penny." The price is exact and will not change. This is an exact price that you can count on for 30 days. When comparing prices from different landscaping material companies the most important price to you is the TOTAL of all material costs DELIVERED to your property. Don't be deceived by a little lower delivery price and end up paying twice as much for the (landscaping) material. 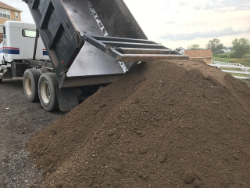 Our delivery price is higher than most other companies, but for a 15 ton load of most materials we are up to $300 less than the retail landscaping material companies because we deliver the material direct from the source to you. It costs us less, so we charge you less. You get cleaner material, for less money, delivered faster. We use courteous professional drivers and often times we can deliver it the exact day you request it. If not we will make our best effort to get it to you in a satisfactory time frame. And if we cannot help you, we will cheerfully refer you where you might be able to get what you are looking for. We are an honest, hard working company that delivers quality material for a price you can count on. Pick up the phone and give us a call and let us show you what we can do for you. How to Build a Long Lasting Driveway or Parking Area. Level the area as much as possible. If you don't have a tractor, you can usually do this with a rake or a shovel. We deliver the recycled asphalt roadbase or recycled concrete. We will spread dump it if possible, at no additional charge. There is no charge for spread dumping. However we must stay clear of any overhead trees or wires. You may need to knock down any high spots in the material, usually just at the edges. After spread dumping, get in your heaviest vehicle, usually your car, pick-up or SUV. Drive back and forth over it a few times and you will have a hard surface driveway that should last 3 to 5 years at a 2 inch average depth, 4-6 years at a 3 inch average depth. 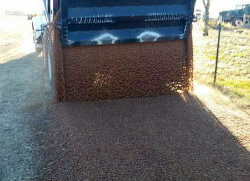 Instead of spending your entire weekend and back spreading material, let us drop spread your materials in place. Save, time, save money, save your back and make your spouse happy all in one transaction. Call us today! Remember: One ton of roadbase covers 80 square feet, 2 inches deep. One ton of roadbase covers 60 square feet, 3 inches deep. Call today for a "no cost or obligation" bid or use the form below. We sell a variety of long lasting materials for driveways, parking lots, garden shed pads, tiny home pads, and storage container pads. The most commonly used and best value in long lasting materials is roadbase. We sell recycled asphalt roadbase, recycled concrete and granite roadbases for these and other uses. Roadbase keeps the area around your home dry and clean. When applied properly with proper drainage, it will reduce or eliminate muddy patches and establish a condition that will drain water away from your home. You need a solid surface for a quality driveway. Roadbase is the longest lasting, least expensive material. 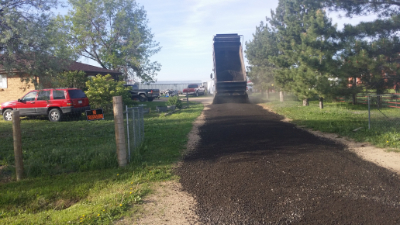 Recycled asphalt is the best of the roadbases for driveway material. It compacts well and stays compacted, doesn’t get dusty, and for this use should last 6-8 years. Remember roadbases are an engineered material. They are made to specification. The asphaltic roadbase spec. provides for a uniform material that is consistent from batch to batch. The material needs to be at least 2 inches deep to compact and stay compacted, but not over 4 inches thick. 1 ton of roadbase covers 80 square feet 2 inches deep per ton, 60 square feet, 3 inches deep per ton. We can deliver up to 15 tons in a single dump truck load. We will spread dump the roadbase across your area of coverage, for no additional charge. Call us today at 720-298-0948 for a no cost or obligation material and delivery bid. We are here to answer any questions about these or any other materials we sell, and to schedule delivery. 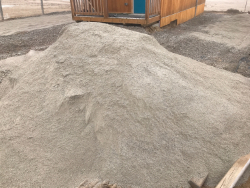 Our screened fill dirt works well for filling holes, building berms, foundation drainage, covering up tree roots, filling in old swimming pools or foundations. Fill Dirt has NO FERTILITY value and shoiuld never be used where you want anything to grow. Never use it in a garden! 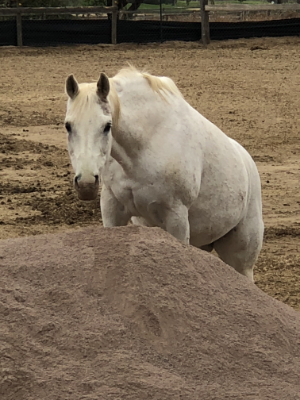 Our Screened Fill Dirt compacts well but is not guaranteed to be clay free. Meaning when it gets wet the dirt may expand and damage concrete poured on it or retaing walls built on it. Call us if you have any more questions about this or any of our other materials. It DOES NOT work for trying to grow anything. Even though it has been screened there is a small amount of rock (and possibly foreign objects) in it. This is the nature of fill dirt! Clean Fill Dirt $10.95 per ton. A classic for the Front Range. Mountain Granite is one of the most popular types of decorative rock sold in the Denver area. It contains a mix of colors and is a distinctive landscaping material that will give your landscaping design distinction. Please allow one day to schedule delivery, Monday thru Friday. Quote is good for 30 days, there is no cost or obligation to purchase. Prices are subject to change without notice, however they are not expected to increase soon. If you are not sure what material to purchase or how much to specify, you can always call the office and get help. You must order the material in the correct unit prices. Cubic yards is used for mulches and compost, tonnage is used for everything else. There are material calculators on each page. For materials not listed, specify the exact depth, width and length of the area in the comments section. Thank you.